Justafixation came out in '96, and is more psych than beat. I think Voyage Through the Sugarcube has the edge, but there's some great stuff on Justafixation, including the Koobas' freakbeat track "Gypsy Fred". 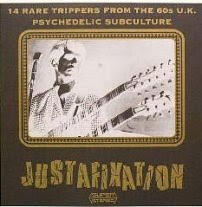 There were 3 other volumes in the series: Justafixation #2, Justavibration (softer British psych in a Circus Days vein) and Justification, which is the beat volume and the best of the lot. They aren't so hot in the sound quality department, unfortunately. This is a Rip from the original LP.